Tax Day Blues Blog Hop April 15th - 17th !!! Welcome, welcome! Hope you've had a great time hopping so far. I know we have many creative crafters in the lineup. I have to say that when I first thought about the hop this could be fun. I then after saying yes thought oh no now what will I do? Before I go any further, if you've come from Jill, at The Scrapoholic then you're in the right place. If not then you may want to start at the beginning of the fun with Angie, our wonderful host at TuttleTime. I want to give you the line up in case you get lost along the way. My Mother and Step-Dad stopped by I mentioned about the challenge to my Step-Dad. He gave me a look and said he'd think about it. I was so appreciative of this. I called my Mother a few days later to remind her of something; my Step-Dad asked to talk with me. When he came to the phone he said how about a saxophone with notes; playing "The Tax Day Blues". I immediately went to my cartridge library to only find that I didn't have a sax..hmmm. I got into my Cricut Design Studio and got to work. This is the result of the work. I hope you like it. 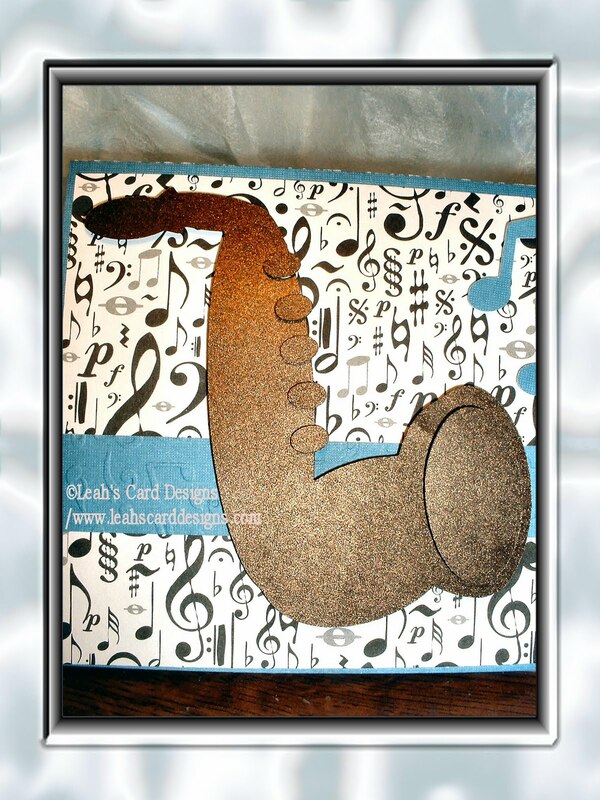 I used an 8 1/2 x 11" piece of cardstock I had on hand then I found this awesome music paper in my stash and thought oh yea!!!! This is perfect!!!!! I thought this will fit perfect with the theme. I hope you enjoy it as much as I had fun in making it. I can tell you the size of the saxophone is about 4". I love a challenge!!! I thanked him again and again for the inspiration behind this card. I can tell you he just might find this card in his possession soon. Now for you to enjoy the card as well, then I will give you your next stop. All of us should have your step-dad for inspiration! hehe Really nice card, fits perfectly with the theme! My son's a sax player and I really wish there was a sax on a cart. Great job on creating your own! What a clever idea. Love your project. Thanks for sharing. very nice, i love the background paper! Love the card! what great inspiration too! the card is so fitting! TFS! Very cute. I love the paper. Great card! I absolutely love the music paper you used, TFS! Great job on the sax, you are very creative! 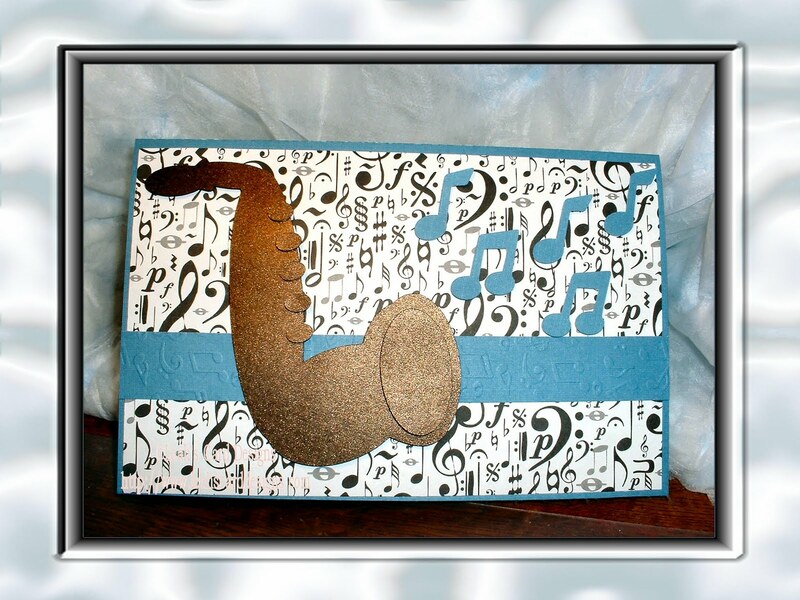 Lrah, I think you did a great job on this card and your sax came out terrific! Love your interpretation! Very creative:-) I'm already a follower! Ah, your sax card reminded me of seeing President Clinton on the late show playing his sax. Oh Wow! 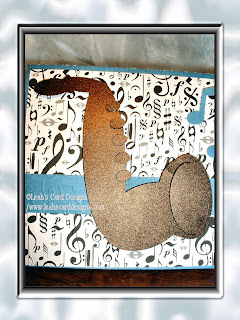 That is a terrific sax, and great card! Love your blog.. Following ya. Kudos to your stepdad! Great idea! Great job on the card. it turned out cute. love your card super idea. Hi Leah! I'm a little late hopping about my fellow bloggers. Great card! It's always great to have somebody to help you out on an idea, I think its great that your step-dad did so. 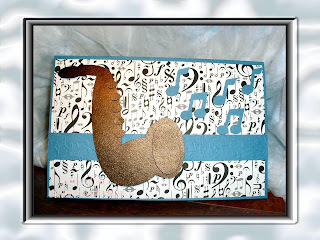 And without having the sax, it sure looks like a sax!